Yetta Goodman, way back in 1978, coined the term, kidwatching. Kidwatching is an observational assessment of children’s performance and responses to instruction throughout the school day. Anecdotal records or more structured teacher checklists often document kidwatching. It’s truly one of the most effective ways of learning about children and how they think…and today, in my 4th grade math class, I saw some really cool behaviors and learned some new things about many of my kids. I began 2 weeks ago teaching a group of 4th graders (and one 3rd grader who joins that group) about binary numbers. One of our goals for teaching place value is to help kids understand that the PLACE of a digit tells the VALUE of that digit. Kids typically don’t get that, either verbally or intuitively–but they have memorized the decimal place value chart by 4th grade, so the strategy many kids use is to read the whole number, then look back at the question to find which digit they need to name, then try to remember what they said as they read the number, or make a place value chart so they can translate that one digit from what they they just said. Sound confusing? It is–and there are many, many kids who make silly mistakes on tests, simply because they don’t understand the bold italicized sentence above. They think the digits cannot stand alone in that place, without the whole number. So I decided to try to teach that sentence to understanding with these kids who come to me for extension in math two days a week. I asked them to write a brief comment on what they thought it might mean. Most just repeated or reworded the sentence a bit, not seeing anything wrong with saying ten when they saw the 1 and 0. Then, we used a website, Math Is Fun, and scrolled down on that page to the section labeled decimal vs. binary. Next, we discussed what place value meant, then we talked about the word part “bi” and thought of other words that have bi- in them and then I gave a quick intro to how binary numbers worked. I talked about computers, showed them the periods of the binary system and they immediately made connections between the sizes of their iPads and computers, and they brought up the game 2048, recognizing the binary numbers from playing that game in 3rd grade. I deliberately used the terms decimal number system and binary number system instead of base 10 and base 2, because I wanted them to relate to the word system and look for the system of the numbers we were going to compare. That was the end of that day’s lesson. For the next several days they first made the binary chart from 1-20, then worked on a couple of worksheets converting binary numbers to their decimal equivalents and decimal numbers to their binary equivalents. They also had some addition and subtraction problems regrouping binary numbers. This week, in their homerooms, they began a multiplication unit. I had planned this week to have them work in other bases to make sure they understood how the number systems worked, so I decided to continue that. At the beginning of today’s class, one kid raised her hand and asked me what bases had to do with multiplication and why weren’t we working on multiplication. I responded that I had decided to go ahead and finish out the work on bases I had planned, knowing that after today’s work, she would understand. Today’s work was varied, depending on the kid–some were simply working through all bases 3-9 to write the numbers 1-20. Others were counting in bases at a random decade (from 70-90 in base 8, for example.) Yet others were taking random numbers (49, 76, 114, 162, etc.) to convert them to several different bases. Most were making up their own challenges for themselves, sometimes depending on their interest, and sometimes depending on the partner they had chosen. They were all totally engaged, and working hard the whole hour they were in my room. So, at the end of class, two boys came up to ask me to check their work on converting a number in the decimal system (that was in the thousands) to their base 4. They were absolutely correct, and I asked them how they had figured it out without a periods chart. They then turned the paper over and showed me their chart of 4 to the 5th power-1, 4, 16, 64, 256, 1024. The number they were trying to convert was 1,028. They said when they saw 256, they had doubled it, and when they saw 512, they remembered from 2048 (the game) that 512 doubled to 1024, so they knew the conversion then- 1 set of 1024, 0 sets of 256, 64, or 16 + 1 set of 4, and no sets of 1s or, in base 4, 100010. I was surprised by today’s class for several reasons…the ability they had, as a group, to manipulate numbers in their heads was so different from a 5th grade class I worked with another day, their remembering the numbers from the 2048 game and their use of them in the bases, a kid saying he needed to really understand bases so he could do better programming since he was going to be a computer programmer when he grows up, the engagement of all 17 kids, even a few who were new to the class today, and the total immersion in setting up challenges for themselves as they worked to understand the patterns and ways each base worked. The fact that most of them were totally working independently, working with a partner, (so there were checks and balances) and having fun was great. But the conversations and explanations I heard clearly said they understand the systems better now that when we began last week. The fact they were looking for combinations of factors of a number showed their deep understanding of decomposing numbers. And, the way they were manipulating digits in various places to both show that factoring and the total number said they have grasped some major understandings of place value–my original goal. Today was a day for kidwatching. Now to help them verbalize those understandings and consciously recognize what they know and have learned…that’s tomorrow’s work. It’s a brilliant article…and I want to take on each point and talk about how I try hard to UNTEACH these things in my classroom. What is authority, and was our country created through the dependency on authority? What would the United States look like had we depended on England, instead of relying on ourselves, those of us who were right here in the “New World.” When should we depend on authority and when should we question it? IS it simply a matter of depending on it? Should we depend on authority or RESPECT authority? My kids better listen to me when we have a fire drill, or God forbid, a real fire or other natural disaster. But if I tell them to respond to questions 15-60 in a workbook in one night and it happens to be the night of the school play that most of them are either in or going to, they better ask me what I am thinking. I teach my kids to question me…respectfully. For example, when I taught kindergarten, I really thought schools had too many rules–I still do. See my post, Rules-Schools Have Too Many, here. There are specific structures I put into place to take the “permission giving role” away from me. Turn the questions around to the child and make them think about what they are asking. (“Can I go to the bathroom?” me–“I don’t know, can you?” Someone then reminds them the rule is go when you need to, and try to avoid missing direct instruction.) When kids complain to me about another kid bothering them, I ask, “Did I do that to you?” And when they say no, I encourage them to talk tot he individual and use the strategies I have taught in class. (1st, talk to the person using an “I statement.” 2nd, if the botherer doesn’t stop, be more direct and tell them to stop, repeating the “I statement.” 3rd, Walk away. 4th ask for help–from a teacher, adult or friend.) I encourage problem solving, sharing your feelings and being independent in notonly schoolwork, but social situations as well. There are specific structures I use to get kids to think deeply–see this blog post, My Class Didn’t Work This Morning–or Did It? As the article says, But we should all be capable of choosing the authority in our lives. Adherence to authority should never be compulsory, and it should never go unquestioned — whether they’re your preacher, your boss, your teacher or your best friend. No one knows what’s right for you as well as you do. And not letting kids discover that fact for themselves may be the biggest failure of all. Okay, so let’s speak to failure. YOU LEARNED THAT FAILURE IS A SOURCE OF SHAME. I take specific actions to help kids understand they are not perfect and need to accept and learn from mistakes. We certainly talk about how mistakes help us learn, that we can’t learn and grow if we don’t make mistakes and I have a sign posted in my room that says, “Mistakes are an opportunity to learn.” But, I also do things to help kids see that as true for others outside of our classroom as well. Check out this blog and what I did with it. It, for me, is really about helping all of us to get smarter, together–not about ranking and having folks feel smarter than others–it’s about feeling smarter right now that you did a few minutes ago because of increased knowledge, competence or skill–your own, not someone else’s. Schools CAN accomplish this–read this former student’s comments about his High School experiences–and yes, he’s talking HIGH SCHOOL (in my county)! “Robert T. Packard Hmm. This was a fascinating read for me, and it reminds me how fortunate I was to find Murray High School. Murray did have standardized tests, obviously, but the rest of the year the focus wasn’t on our grades so much as our progress and achievements. Having the option to actually redo assignments to get the grade that we wanted gave me the ability to set my own standards for myself, rather than measuring my success by some numerical score from my teacher. I also got a lot of freedom in catering assignments towards my personal interests, rather than having to deal with a one-size-fits-all model. Another beauty of Murray is that we were given the freedom to fail. Well, technically, no, we weren’t, because there was no such thing as failing, just being incomplete. When our work didn’t meet the requirements, we got to try again and do better. That taught me that failure can be an important step along the way to success, as well as a good teacher in its own right. As for depending on authority, I’ve always been a bit of a contrarian by nature, and Murray’s atmosphere really allowed that aspect of me to flourish. I never really viewed the teachers as authority figures there, but as people trying to share knowledge and experiences. I formed friendships with many of them, on a more equal level than would be possible in a more traditional high school. Murray is proof that it’s possible to go more in this direction than traditional schools do and still succeed. Not all of the techniques would work for everyone, of course, but I think that’s exactly the point; by trying to fit all students into some cookie cutter format, nobody is getting the best possible experience from their education. YOU LEARNED THAT SUCCESS COMES FROM THE APPROVAL OF OTHERS. I don’t say, “Please don’t yell out answers because it’s against the rules.” I tell them not to do it because they take learning away from other people if they get the answer first and shout it out. I tell them they are not being a good member of our group. I tell them they are making themselves look inconsiderate and selfish. I work hard in all that I do to get kids to learn self-regulation, not learn behaviors just to please the teacher. This is one of the hardest things for many really smart/gifted kids to learn. After all, a life need is to belong–to feel accepted—and if we aren’t given that feedback by the behaviors of others around us, we seek it verbally–is this right? Did I do it correctly? Gifted/smart kids often think they have to be ranked to be successful–they have to be better than others to show their learning–they have to be perfect and always right and if they aren’t something is wrong-with them. I don’t give a lot of grades in the work I give kids because they know whether they know how to do it or not. The conversations we have in class, their confidence in working new problems, their willingness to share with others gives them that feedback. Their parents may care about daily grades, but learners just want feedback on whether they are successful or not at that particular task. When they are practicing a specific algorithm or strategy in math, for example, and I mark on their paper, they don’t ask me what’s the grade? They look at the ones I marked they need to revisit and go try again. I don’t need to give grades as long as they get the feedback–and most times they don’t care if it’s from me or a buddy. I simply help when they need it, when they are confused. I ask the questions that help them understand deeper. I share info that helps them look at things from a different perspective. I listen and affirm, but don’t generally talk right or wrong. We talk “better responses” or “more efficient” or faster, more detailed, easier to understand, etc. We compare and contrast–and by sharing our thoughts and strategies, kids learn there is not one right way to do things, not one right answer, necessarily, and they learn to be flexible thinkers. THEY know if they know the skill or not–and when they go home and Mom or Dad asks if they did well in school, and if they got an A, and they say, “I don’t know, Ms. White didn’t tell me” I believe they aren’t being completely honest-either with themselves or their parents–and it could be conscious or unknowingly. Learners know when they know how to do it confidently or not. When parents then complain to me about no grades, I know something about the kid’s willingness to communicate–or their willingness to understand their own learning. Success does not come in the form of grades, or the teacher’s approval, or the information in a note the teacher sends home. Success comes from an inner feeling of knowledge, of happiness, of satisfaction, of confidence, of knowing one’s own strengths and weaknesses and being willing to work on or accept those. That’s what I try to help children learn. These are some of the videos I show my kids as we talk about feedback and understanding one’s own learning. So as we begin a new school year, I once again revisit my own beliefs, and my own history to remind myself that distracters and naysayers cannot change my inner core beliefs about helping my students be independent learners who are empathetic, confident contributors to our world who know how to think, communicate, justify their responses in ways that share their learning, respect others and make sense. This article should be the basis for any school’s revisiting their school vision and mission to make sure we are supporting kids who will not be afraid of failure, but learn from it; who will respect authority, but think critically, know how to search facts and understand the nuances of putting someone else in charge of oneself, and who will choose the authorities in their lives; and who will, most of all, look inwardly for measures of success, who will be successful in life and thrive, happily, doing something that contributes to our world and feeds their inner soul much as teaching and working with kids does mine. I am such an Introvert–yes, with a capital I. I truly renew my energy when I am alone or with a small group. It takes a lot for me to enter a convivial group, but I do it because I know it stretches me and helps me learn–and I love the friends I have made on the Internet and at conferences and in so many learning places–and I want to see and connect with them all. So I am here at ISTE15, but I am in my room, skipping #HackEd, because I have to sort out some thoughts about the momentous Supreme Court decision made yesterday–to allow marriage between any two consenting adults. “The decision is a reminder that “change is possible, shifts in hearts and minds [are] possible,” he [President Obama] said. I am an Introvert, yes, and I am also gay. Early in my career, I almost lost my job over being accused of it. I had to deny who I was, and I had to deny who I loved to keep my job. 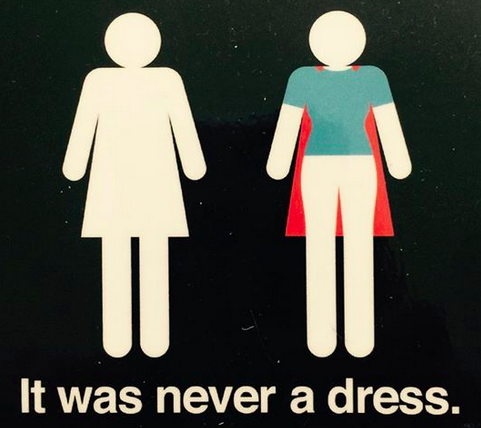 So I’ve been there–in a spot of being discriminated against because of who I am. I’ve been there–surrounded by judgmental people who wanted to do something mean to me just because of who I am. And, I’ve been there–thinking there was something wrong with me because of who I am. I sit here and write on WordPress, and look at the rainbow header–their doing, not mine. 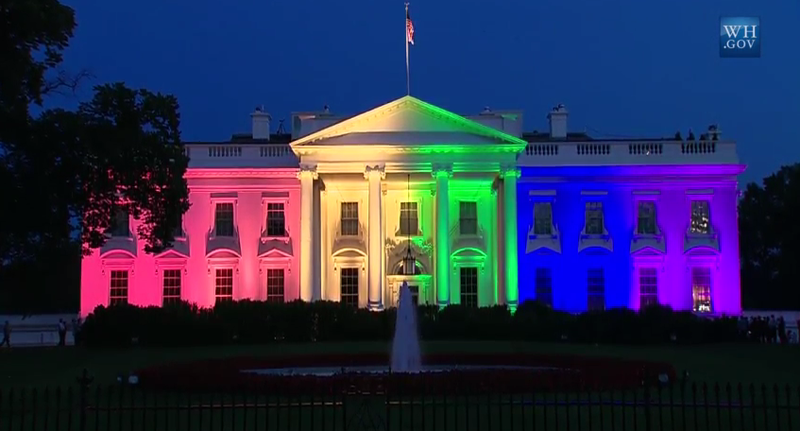 I think of the picture of the White House–the White House, for goodness sake, bathed in rainbow colors! I think of all of the amazing responses we have gotten from folks when my partner of 22 years and I announced we had decided to get married this summer. I think of a post I saw on FB by my partner, Becky, about all of the bible thumping folks and hope it is read…This is an interesting read for folks who are thumping the Bible over today’s SCOTUS ruling – http://m.huffpost.com/us/entry/3397304. I think of all of the rainbows I have seen all over Facebook in the last 24 hours, and I think of the kids I teach. Because despite all of my past fear, hurt and anger, (at times), over the discrimination I have been shown, what I mostly think about today is the children. They will grow up in a different world than I did. They will hopefully not be threatened with losing their job over who they are. And they will hopefully be in a school system that will support them and encourage them to be who they are, as they figure that out. Not all of us know right away who we are, and even more importantly who we want to become and what we can do to get there. I think of all of the people who, for one reason or another, judge others and treat them differently because of that. I think of the bible teachings I learned as a youngster–“Judge not, lest ye be judged” and think of all of the hypocrites I have known–that claim to be Christian, but judge anyway–and treat others according to that judgment. And I think of how that treatment changes folks–kids or adults–in how they think about themselves, how they perceive their interactions with others, and how that affects who they are and who they become. And I want teachers, everywhere to realize there is a LOT of literature out there right now with gay characters, with transgender characters, with characters who are struggling with eating disorders, or mental or physical disabilities–and with many, many other issues kids deal with, often without help. Developing empathy in kids supports kids who need it getting help. Reading and talking about books like this change kids. as a group of third graders, I had a kid say she didn’t want a child like Melody in her room because it would take too much of the teacher’s time and she wouldn’t learn as much. I kept pushing books on her that dealt with kids with issues and two years later, in fifth grade, she said it was one of her favorite books of all times. …with all kids–whether they be introverts, extroverts, gay, transgender, biracial, questioning, incredibly smart, incredibly needy (for whatever reason), disabled (however that may be), “normal” (whatever that means) and/or any other way kids are. We can make a difference no matter who or how they are. So as we sit in our sessions at ISTE15, (or any conference, or any professional development, or any meeting, or any classroom, for that matter) and talk with the folks we see rarely, at conferences, I am thinking we need to always think about what we are helping the children learn–what are we inadvertently teaching them by NOT talking about issues important to them? What are we saying when we have no books about gay kids or parents, when we don’t talk about the social issues they are engaged in, when we ignore the pain we see in their eyes or faces as they walk in our rooms? We, as educators, need to be open to all sorts of learners, to all sorts of people, and, more importantly, we need to help them empathize, to care, and think deeply about who and what they are and want to become. We need to help everyone in our lives understand we are all people–mostly with the same insides, and mostly with the same goals in life–to survive (and thrive), to be happy (have fun), to be loved, to be safe, to belong, to have control over our lives, and be free to be ourselves. I’m thinking we need to be familiar with lists of books that help kids understand other kids. And I’m also thinking we need to get some serious conversations going among educators about how to shift hearts and minds, as President Obama said. No matter how many last days of school I have, I am always gratified by the kids who stop by to say something to me–whether it be a simple “I’ll miss you” or a heartfelt “You were the best teacher I ever had” kinds of comments. This year was special, though, in many, many ways. Yesterday one of my 5th grade boys came in and I showed him I had just gotten the 2nd book in a series we began this year. He was SO excited, so I handed it to him and asked if he wanted to read it. He took it gratefully, and asked if it was good. When I told him I hadn’t read it yet, he tried to give it back–“It’s your book, you should read it first.” Nope, kid, it’s yours to read now…think I’d squelch that excitement you showed? No way, no how. I got an email from another boy’s Mom, this one a 4th grader–“We bought Neptune Challenge and he’s already started it.” (Another book we read the first one together- the second one just came out.) This kid talks to his MOTHER about books, he goes home so excited! They read books together now…and that just began this year. As I reflected today on the end of my day, I realized that in August, I’ll begin the school year for the first time as an NBCT, since my certification began in November. I then thought that kids should be part of the National Board Certification process…and then I said to myself–wait a minute, they really are already. When we who aspire to get that special certification videotape in our classroom, we show other professionals our kids, and how we teach. When those same already-recognized-with-this-honor teachers read our case studies and see our kids’ work, the kids are speaking to them as well as I did when writing those studies. The kids speak by how they act when learning–by what they say when they are with other kids, and how they grow and change as they work throughout the year. That’s my “new beginning” goal–to do what that kid wants me to do–inspire others to push their limits and think outside of the box. I haven’t written on any blog for quite some time. I haven’t done much writing on any social media for quite some time. I have been involved in my schoolwork, my kids and more recently, getting ready for my wedding. I have lots to share about all of that, but really, with all the news focusing on Caitlyn Jenner and a post that came over my feed today (Heteronormativity in Schools) and a recent happening at school, I just need to think out loud. “In science, technology, arts, mathematics, politics, houses of worship, on the streets, and in our homes, insightful women are often uninvited, overlooked, or just plain dismissed. Then the original girl and another kid asked to put some around the school. I suggested they put them in the girl’s bathrooms, and so we printed a bunch out and a middle school helper and two 2nd graders organized hanging them around the building. About 15-30 minutes later I was in the girl’s bathroom when an adult came in “checking for signs.” All of the work the girls had done had been undone in less than 30 minutes. I don’t know on whose authority (our principal wasn’t there that day) and I also don’t know why. It’s been a heck of a week, and frankly, I just haven’t had time to ask. I will ask, but we’re two days away from the last day, and it’s crazy busy right now. I have also been wondering why no one said anything about it–no question to the staff, no comments, nothing–and there’s one of these on my door, and on the doors of other teachers/classrooms in the building. I am a gay woman getting married this summer. I have gotten some pushback about that from some surprising places, but have encountered MUCH more support, and my colleagues and principal have been just plain downright wonderful. As I said to my staff in a celebration they gave me, unless you’ve been part of a minority that’s experienced discrimination, you really have no idea how deeply it impacts your life in many, many ways–both good and bad. It makes you pay attention to things that may mean nothing, but may also be representing people unthinkingly perpetuating discrimination or prejudice. One often doesn’t know, but if you are part of a minority group, you wonder. At least, I wonder. I just can’t help but wonder why a picture that makes young girls think about themselves as superheroes would be a bad thing to post in an elementary school. Thoughts? Today is the 5th annual picture book event: #pb10for10. Here’s how you participate! The Napping House Not only does this book show varying perspectives of the room on each page, but I have an incredible story to go with it. I had just read this book (numerous times) in my kindergarten class right before one Halloween weekend. Over that weekend, one of my students was in an accident and went into a coma. My Teaching Assistant and I went to see her Monday after school and when we talked to/at her, her brain pressure dropped, so I kept going back, and took books to read to her as I sat with her. Whenever I read The Napping House, she became visibly calmer and seemed to be hearing and recognizing it. I left the tape that went with it, and the nurses would play if for her. When she came out of the coma, she asked me to read it to her…over and over…so I know reading a favorite book made a difference for this child. Piggie Pie NO group of kids I have ever shared this book with has not enjoyed it tremendously! The Potato Man (and The Great Pumpkin Switch), but these go together to show storytelling and the importance of seeing the world through another perspective. Kids want to know where # 3 is–and some of my 4th graders even wrote their own “Lucky Penny” stories. Bedhead and Baghead (two books, but they go together) Having a bad hair day? These two kids handle it differently, but help us understand the commonality of worrying about how we look to others. I could do another 10 like this….but am going to go read other’s lists and gather a whole new bunch of ideas for books to use in a new school year! 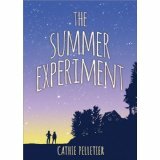 Got my hands on an advance copy of The Summer Experiment by Cathie Pelletier last night and I read it in a couple of hours. (I am a fast reader.) As I read, I kept thinking, “Oh, Katie will enjoy that part.” Or “That sounds like something I might have said as a youngster.” Or I can’t wait to share this with my kids!” (I said that multiple times–I have many kids who will love it.) The one thing I didn’t like was the title….I didn’t think it did the book and story justice. I really enjoyed the story, and wish I could share it now with my kids, though it will be an awesome one to do later in the year as we approach summer, too. The characters are well-developed enough (Grandpa rules!) that I cared about them and will remember them…I even shed a few tears at one point. I laughed out loud as well…so what can make a book better? I really loved the main character, Roberta–reading the story through her words and thoughts was so realistic…and so honest, I wished I could have had her as a friend when I was 11 years old. Living at the very tip of northern Maine, she readily admitted her life was more like the childhood of her parents and grandparents, but iPhones and the Internet were part of the story. The innocence, though, and the freedom the kids enjoyed was a reminder of times gone by in most areas. It’s a great story of acceptance, grace, sibling rivalry and connections and knowing when to push growing up. My birthday is December 10 and my best friend’s is December 11, the same as yours. I can’t imagine not having her here to celebrate my birthday with and I know your family is probably looking at your 8th birthday without you with sadness and longing to have you here. It says so much that your family nicknamed you Joey from your more formal name of Josephine–my dad did the same for me as a toddler–from Pauline to Paula. I love the nickname Joey–I wish I had known you personally. However, your pictures say a lot about you. Your precious smile, your contagious enthusiasm for life and your eager willingness to play and be silly will always be missed. But is it exactly those things that will also sustain the ones who love you and wish you were with them today. You made your family smile. You made your family laugh. And you made their hearts full when you hugged them and shared your love with them. I am so incredibly sorry your life was cut short. I also know you are in a loving, giving, wonderful home now where you are being taken care of with care and grace. Your family’s sorrow may last a long time, but their love–and yours for them–will last forever. Love transcends all. The strength of everyone involved in the Sandy Hook tragedy has impacted the world. Teachers (and I am one) now look at our classrooms differently. (Where would my children be safer? What would/could/should I do to keep them safe? How can I keep them safe?) I keep my classroom door locked. I talk with my children about strangers more and the importance of following OUR safety procedures. But I also make sure that worry does not permeate our lives–because I want to see the smiles on their faces like the one on yours in your pictures. I want them to be enthusiastic about life and all it has to offer, as you were. I want them to play and be silly and enjoy the laughter and love of those around them as you did. You see, you–and your friends–and your family and other families of Sandy Hook inspire those of us who are left. The pain, fear and incredible sadness you all had to endure was way more than any one should have to overcome, especially at such a young age. But your legacy is to leave the rest of us with determination to be like the Sandy Hook community–to be brave, stoic, and strong in the face of adversity. Your legacy is inspiration to make each moment count and live, love and laugh to the fullest of each moment we have. Your legacy is a promise of strength, connecting and sharing to survive together. Your legacy–that you left to each and every other person in the world–is hope. And I thank you and your family for that precious gift. May God bless you all. From Nicolas, a kid I taught in 5th grade, who is now in 9th. Nic has some interesting perspectives, but the thing I have always appreciated about him is that he is thoughtful, caring, looking to make connections, a risk-taker and first and foremost, a person I am proud to know. Just as my opinions are my own on this blog, his opinions are his own on his wiki and blog. 50 years later, I could have told you (before I looked them up), that they were set in Sweden. I knew they were books about triplets and that I loved poring over the illustrations. Then, I got more into science fiction and fantasy and in college and when I began to work, I began buying my own paperbacks–and so when I moved into my house, I had to have floor to ceiling bookshelves for those books I had been moving from place to place. I also have bookshelves all over my classroom and have spent way too much of my lifetime salary supporting my love of books. I mostly spend on children’s books now–just to keep up with the upper elementary kids I teach. I introduced Out of My Mind and The One and Only Ivan and Hurt Go Happy to the kids in my school. I read the Nerdy Book Club posts and often buy the books reviewed there. Just the other day I watched the Scholastic Spring Preview and immediately got some of those. And I am still wondering why schools often don’t make a lifetime reader. I grew up on Lucy Calkins, Donald Graves, Regie Routman, Jane Hanson, and others of that era where we began talking about really teaching reading and writing like real readers and writers act. Yeah, I’ve read Donalyn Miller’s Book Whisperer and Reading in the Wild. I have kids who are readers…and I have kids who can read, but choose not to. I have kids who HATE, HATE, HATE anything that has to do with Daily 5 or a literacy menu, because they see that as making reading boring. Kids don’t mind discussing books–but filling out packets of comprehension questions doesn’t cut it with them. And, I’m seeing more and more of that coming back into our classrooms. So I struggle with preparing them for the state tests, which gives them a passage and asks them to answer questions like those typically found in packets. I sporadically give them worksheets on making inferences and reading for meaning, and interpreting various kinds of reading (poetry, narratives, non-fiction, etc.) but those don’t make them a reader. They support them becoming a good test taker. And, as a teacher, I do see that as part of my job–because taking tests is part of schooling as we know it now. I spend most of my time with students talking books, sharing books, enjoying stories together and supporting them loving to read, thinking deeply about connections and meanings and themes. But it’s the talking that matters to my kids. They have a lot to say, and most of them are really thinking. They have questions, they wonder, they ponder why an author did this or that, they imagine being in the story, they engage with the characters, they connect around similar plots and characters, and they share recommendations for good reads. I wish they could prepare a portfolio for the state assessment. I wish theycould write a testimonial to the kind of reading they do. I wish they could share their blog posts of reading recommendations. There are a ton of things my kids–and all kids–could do to show they are successful readers beyond reading a passage and answering multiple choice questions about it. But while my state requires that test, I’ll continue to do test prep–enough for the kids to do well, but not so much they begin to see reading as a test to pass, or as answering questions, or as worksheets to do. And, in the meantime, we’ll continue to share good books, read together, cry and laugh together over events in the stories we co-habitate in, and we’ll look to finding the next great book that flies around my classroom because we just can’t put it down. Because while I am expected to do test prep, I believe making readers is more important. jenorr73 on What Am I Thinking? 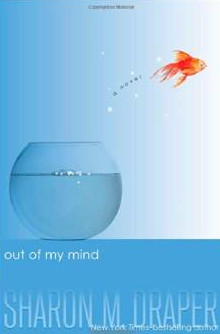 Paula White on What Am I Thinking? Jamie Camp on What Am I Thinking?